It's so easy to make boxes to measure with the scoring blade on my Fiskars trimmer. This box was made for a jar 7 cm in diameter and 12.5 cm high and I made the bottom from one sheet of A4 card stock and made the lid and the tag from another sheet. That's the Right on Track Wheel pretending to be a fence along the bottom of the box and I stamped a hedgerow scene on top. Then I put the box together with strong double sided tape and tied the whole thing up with a length of Chocolate Chip grosgrain ribbon. I even took it to the post office! Hope you're all ready for the weekend - it's set to be a sunny one here! Wherever you are, have a good one! This is gorgeous! I wish it were my birthday!!! What a great use of the tracks as a fence. Wonderful idea! Have a blessed weekend. I hope your dinner was excellent! Great box! Love how you used the track as a fence. I would never have known it wasn't "really" a fence if you hadn't mentioned it. And that pheasant tag is fabulous! What a great way to package a gift for your father. I'm sure he'll love it! Gorgeous box! 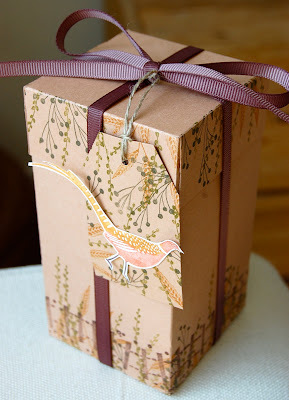 It's so wonderfull to be able to make the box you give your gifts in.